All of us know that Oxygen is crucial for our survival, but most of us are unaware of the fact it also plays a significant part in maintaining the vitality of our skin. The “Lack of Oxygen” in our skin leads to clogging of pores, blemishes, dullness, pimples, dark spots, uneven skin tone etc. Thus, it’s imperative that we understand the need of our skin and take steps to avoid the re-occurrence of unwanted skin problems. Did you know, your skin also needs oxygen to glow every day? The layers of skin need oxygen and nutrients to let it glow and shine but due to blockages, caused by makeup, grime and various other harmful elements, our skin is unable to breathe properly. Also, for people with sensitive skin or who are inclined to breakouts, scents, allergens, additives, and oils in cosmetics make the situation even worse, causing blotchiness or skin inflammation, ultimately clogging pores, and restricting the supply of oxygen. Thus, if you wear makeup, make sure to wash your face twice every day with a cleanser, and if needed, exfoliate well to get off any heavy layers of makeup residue. With the party season around the corner, it is all the more important to ensure your skin looks great in all the pictures you are planning on being a part of! The question that arises now, is how can we give our skin the much needed oxygen it requires? OxyLife is the solution! 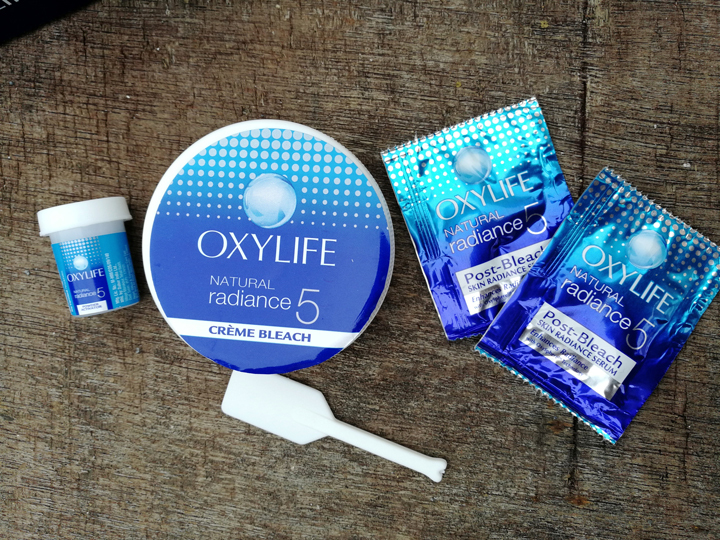 OxyLife bleach- “Oxy Life Natural Radiance 5 Crème Bleach” is a scientifically formulated bleach that makes you glow in just 15 minutes! Enriched with active oxygen and post-bleach skin radiance serum, Oxy Life solves skin problems like-dark spots, uneven skin tone, dull skin, dead skin cells and sun tan. 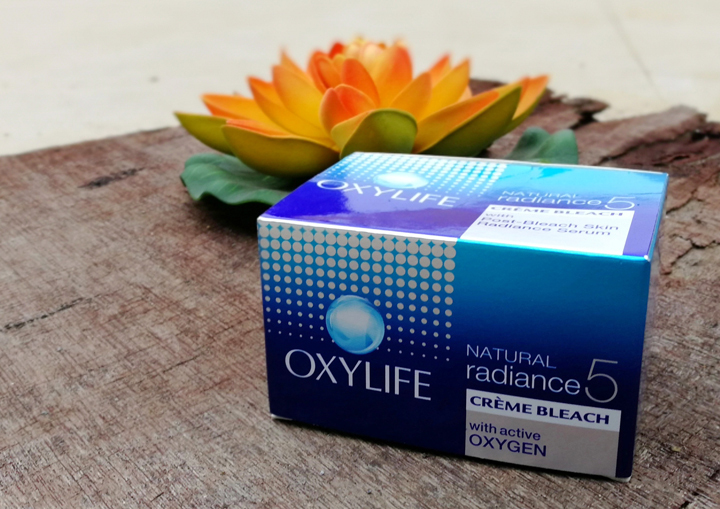 OxyLife Natural Radiance Bleach is enriched with Vitamin E and active Oxygen, to condition the skin well. It has Glycerin which helps to brighten, energize and nourish the skin. It also has a post bleach serum, which helps in imparting radiant & glowing skin instantly, and also enhances the efficiency of the bleach crème. 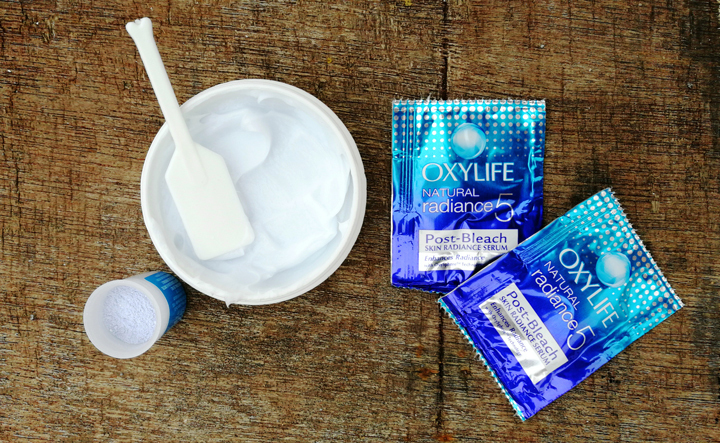 Read on to know how to get fair skin using oxy bleach. It has the patented German Technology-Oxysphere, which enables pure Oxygen molecules to penetrate into the skin, giving a pure boost of Oxygen, leaving it naturally glowing and radiant. Recommended: A first time user must do a patch- test on the skin. Go through the information booklet for exact details. It recommends the time, the bleach requires, according to the skin type & tone. The exact time can be fixed based on your personal experience. After the bleaching process, apply 1 sachet of post bleach serum, which has a gel like consistency. Note: Should be used once in 2 to 3 weeks. I would openly recommend this product to all ladies. This is one of the recommended beauty tips for face as well as skin. The crème’ will help in opening clogged pores and remove dead skin and tan in just 15 minutes of use. Use it once in 2-3 weeks and watch how your skin will glow. Widely recommended dermatologically & tested safe for use, for lightening skin tone & for a flawless fair skin.